Whenever Doctor Who fans gather in any of their various locales, online or otherwise, and discuss "The Horror of Fang Rock", Adelaide seems never to fail to provoke commentary - most of which I have discovered has been dreadfully negative. For those of you who have never seen the episode, it takes place in a lighthouse located on a windswept island somewhere off the South coast of England in the years just preceding the First World War. 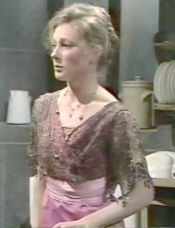 Adelaide arrives in the second of the four episodes as a shipwreck survivor, secretary to the unscrupulous Lord Palmerdale whose pleasure yacht has foundered. Attractive, aristocratic, and high-strung, (in the manner of all the finest Gothic heroines,) she is clearly out of her element when it comes to fighting deadly alien invaders, and as her fellow survivors and the lighthouse keepers are murdered is overcome with fright and sadness. 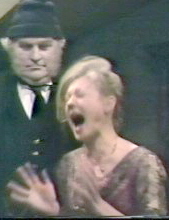 Eventually, near the beginning of the fourth and final episode, she is captured and killed by the alien, who is disguised as one of the lighthouse keepers. These commentators couldn't possibly have found our heroine as irritating as I find them. 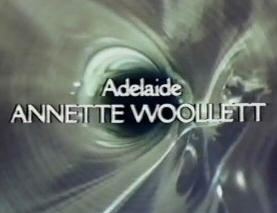 I will grant that my attitude is probably due to the fact that I find Annette Woollett such an exceptionally beautiful and appealing actress; the perfect, "strawberries and cream" English complexion, the golden hair, the long white neck and elegant shoulders, the "wonderous snowy arms" (to borrow Gogol's happy phrase), the big green eyes and delicate mouth, all augmented by the attractive Edwardian dress with the pretty pink bow at the back... And none of the detractors can even acknowledge these charms with the simplest of praises; even Terrance Dicks in his novelisation joylessly introduces her as "a young woman," neglecting to acknowledge her even with the simple, obvious adjective "pretty". Since then I have discovered in various commentaries on the episode many, and often far less tastefully stated, variations on the same idea; Adelaide is not to be missed and her death should cause no qualms due to her emotional reactions to the killings of her compatriots. I have seen it stated on various websites in terms which I find particularly vulgar, callous and insensitive: "Adelaide was so annoying... I was cheering when she finally died", "hearing Adelaide's final scream comes as something of a relief", "Adelaide's death was unexpected, but to tell the truth I wasn't sorry to see her go". 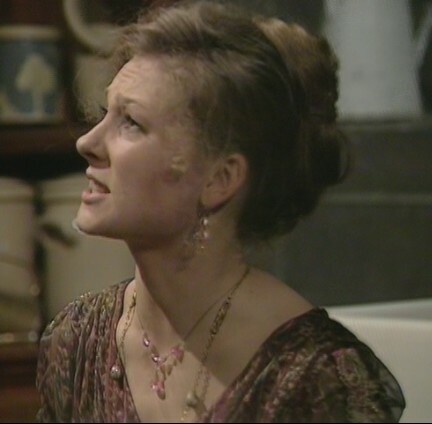 Several others have commented on their enjoyment of a scene where Leela slaps her in order to calm her down after Palmerdale's death is discovered. In conclusion, in my personal script for this story I have provided a different ending, in which another Timelord (played by me,) hears the story in retrospect, takes his Tardis to the lighthouse at the precise moment the Doctor and Leela leave, enters the building and quickens Adelaide with a magic revivifying kiss, a la "Sleeping Beauty." He then takes her to his Tardis, where she becomes his companion for more pleasant and affectionate adventures. A far nicer fate, I think any neutral would agree, for our lovely, misunderstood and unfairly maligned heroine. That's how I like it, anyway!